Ako incident is a murder case in that happened the lord of Ako was bullied by the old man of the government. Some people japanese would love this story that bully parson is killed. We call "Chushingura" that to as dramatized that incident. Though based loosely on Akō incident, "Chūshingura" is a fictional account that departs considerably from the actual events. Numerous other details were altered as well, to streamline and popularize the story for the many audiences including non-historical enthusiasts. 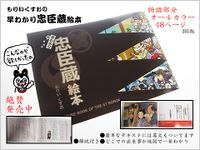 You possible to understand the synopsis if you buy a picture book.You can buy it in Sengakuji tenple of Tokyo, or in AKO of Hyogo Prefecture. Please contact if you want. I will send to you it in some of shipping and 500 yen that you have given me. The content of this book is written in English and French.